Asoftech Photo Recovery is a solution to recover deleted, lost or formatted photos from the HDD, memory card, mobile phones and/or digital cameras. It is designed by Asoftech. Image recovering: once Asoftech Photo Recovery is installed on the computer system or an external device, users can configure it to start searching for image files. After that, a complete list will be proposed to you on its interface. Compatibility: this program supports FAT 12, FAT 16, FAT 32 and NTFS file system. Since it can also restore deleted images on different devices, Asoftech Photo Recovery also supports Samsung Galaxy, HTC Android phone, LG mobile phones, etc. Supported formats: Asoftech Photo Recovery supports a wide range of image formats. Here are just some of them: JPG, JPEG, BMP, GIF, PNG, MP3, MOV, RAM, WAV, WMA, AIF, AIFF, AVI, CWP, SC4 and more. User interface: the interface of this application is quite minimalist. 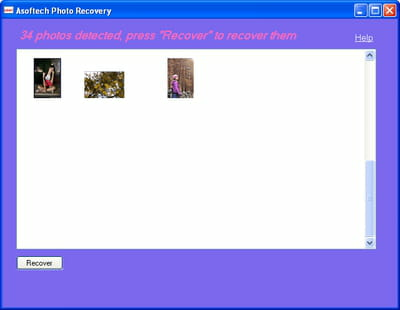 Information about recovered files as well as the location to save recorded photos will be displayed on this interface. Latest update on November 20, 2016 at 02:48 PM.